Little Wienies and barbecue sauce really go well together and when you see the bbq sauce options that I've got for you, that tummy of yours will be rumbling! Before we go any further though, I must first of all, for my international readers just explain the derivation of the word “Wienie”. A “Wienie” is a sausage that was originally manufactured in Vienna (In Austria, Vienna is spelled Wien) and is a derivation of the word "Wiener" meaning Viennese. In essence it’s a very similar beast to good ole frankfurter that we find in our hot dogs that are generally sold in a can. These days, not many hot dog sausages know where Frankfurt is let alone were manufactured there and it's pretty much the same with the Wiener. That said, this recipe is different because it's practically impossible for the amateur home sausage maker to create the same emulsified consistency of a commercially produced Frank or Wienie. So having broken that apart, "Little Wienies and barbecue sauce" is all about making and cooking your own hot dogs, and bbq sauce makes a great alternative to ketchup or mustard and you can spice it up to suit. Note: This recipe contains curing powder so it is suitable for cold smoking following production but this is optional. The yield for this recipe is approximately 1kg or 2lbs so you'll need to prepare approximately 2m (7ft) of hog casing. To learn about casings and their preparation, use my guide to making homemade sausage. Wheat flour contains gluten. I've simply specified flour so if you have an intolerance to gluten you can substitute with rice flour. Don't use cornflour because this turns a little "claggy" on the palate. Keep the meat chilled at all times. Diced it roughly and pass it through the grinder twice using a 4 mm plate (or smaller if you have one). When done, return the meat to the refrigerator. Now mix all the ingredients for the seasoning ensuring that the salt is fully dissolved in the liquid. Again, refrigerate this for 30 minutes prior to mixing to keep everything as chilled as possible. Now stuff the sausage and make links to the length that you desire. When finished let the sausage rest in the refrigerator for at least 12 hours to ensure full dispersal of the seasonings and curing agent. 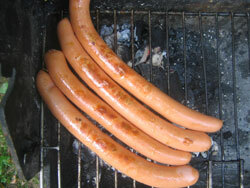 If you've bought your hot dog sausage then it is is already cooked and probably smoked so it's just a matter of warming. You can do this either by poaching or grilling. You need to be gentle in the warming process otherwise the skin of the sausage will split and poaching best suits this. That said, grilling adds a little colour which I like so I poach first to get the dog up to the safe temperature for eating and then grill for a short period to add the colour. For my homemade Wienie you first of all have the option to cold smoke (remember that you already have smoked paprika in the seasoning so I don't think it necessary) and then you very much need to cook because at the moment your sausage is raw. For this sausage I still prefer to poach initially and then finish off on the grill because this adds some smoky flavour. Note: If you cold smoke your Wienie prior to poaching then you will inevitably lose some of the smoky flavour in the poaching water. Don't worry if your Wienie splits during poaching, it's not a disaster and more often than not a canned one will split because most hot dog sausages are made on a budget. It's only when you get the more expensive sausages that they will come in casings designed not to split. To poach, start with enough water in a pan to fully immerse all the Wienies that you want to cook and heat the water up to 82°C (180°F). Add half a teaspoon of salt to the water. Place your Wienies in the water (this will lower the water temperature) and bring the temperature back up and stabilize it between 77°C & 82°C (170°F & 180°F). Stir occasionally to ensure even heat distribution. Poach until the internal temperature of the sausage reaches 72°C (162°F), remove them from the water and allow them to rest for 5 minutes. Get your wienie, a long finger bread roll and the rest is up to the sauce. So for little wienies and barbecue sauce try my traditional barbecue sauce recipe or mustard barbecue sauce recipe. But if you really can't decide just check out all your options on my barbecue sauce recipe page.